and, his commission to preach the gospel to all men, including the Gentiles (22:15-21). 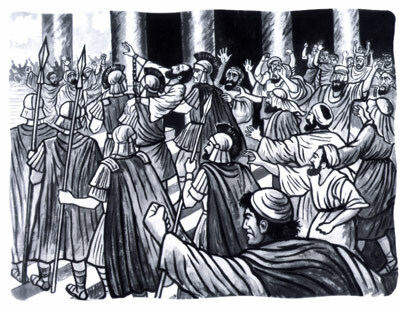 But when he uttered that despised word,“Gentiles,” the mob that had been listening went ballistic, calling for his death. He was not able to finish his message. Paul’s testimony teaches us that being zealously religious does not reconcile us to God. Paul’s testimony teaches us that salvation is by God’s grace and power, not by our merit or will power. Paul’s testimony teaches us that God often must humble us before He extends His mercy toward us. Paul’s testimony teaches us that baptism is an important confession of our faith in Christ. Paul’s testimony teaches us that God saves us for His purpose, not for our agendas. God first does a work of grace in our hearts. No one would ever choose Him. No one comes to Jesus unless the Father draws him (John 6:44). No one is able to come to Jesus unless it has been granted him from the Father (John 6:65). No one knows who the Father is except the Son, and anyone to whom the the Son wills to reveal Him (Luke 10:22). Thank you for this humbling reminder for prayer.